The girls were starving by the time we were ready for lunch today so I had to come up with something quick! They often want Hello Kitty which you may be tired of seeing by now, but they always like it. 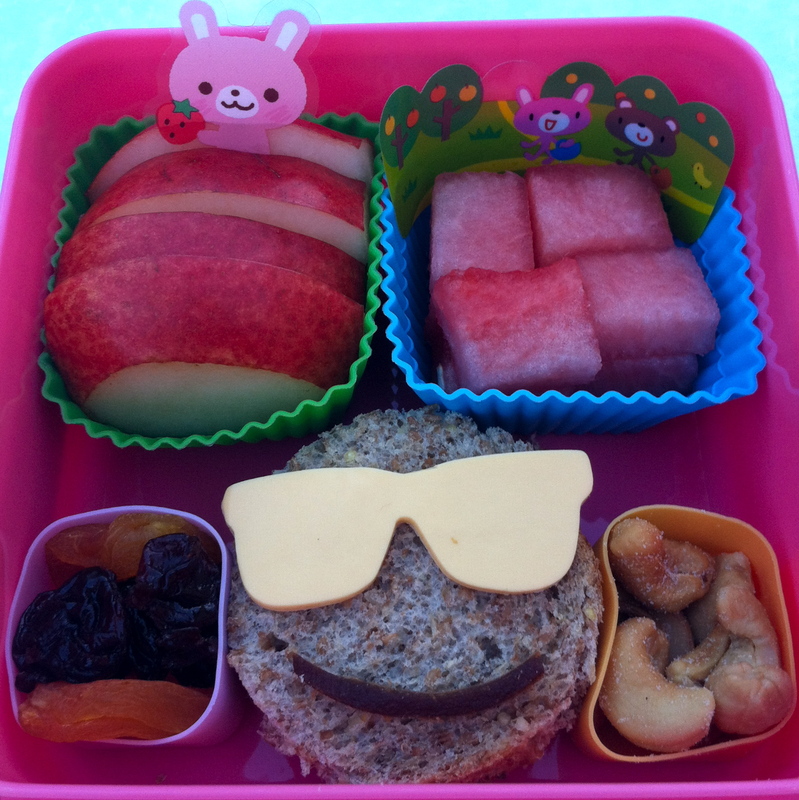 Miss G had a Hello Kitty face sandwich on Rudi’s Whole Grain bread. 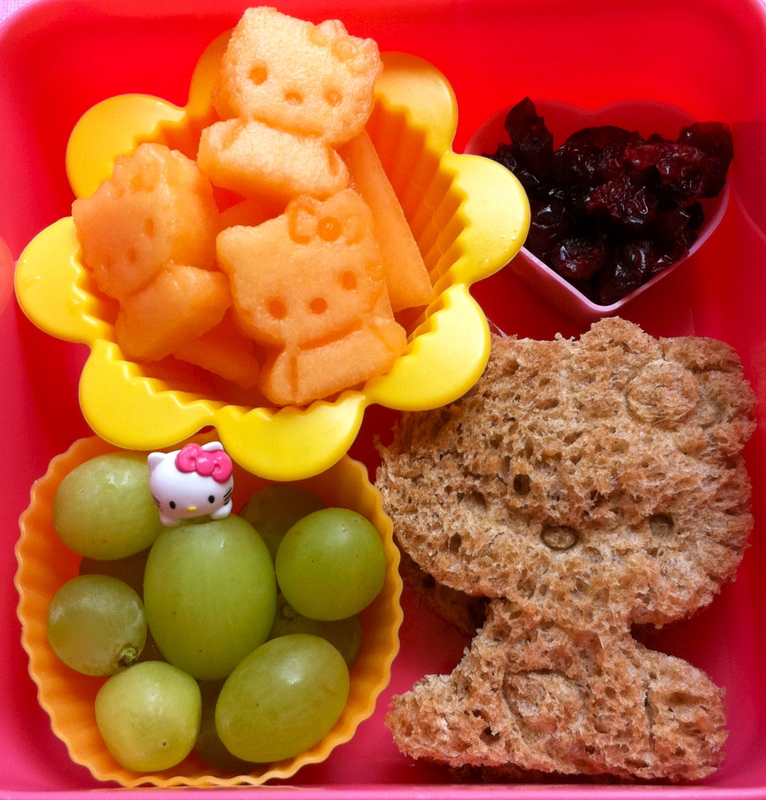 She also had organic seedless green grapes, Hello Kitty shaped cantaloupe pieces and a small container of dried cranberries packed in her Sanrio brand Hello Kitty bento box. Little Sis had the same thing just in different shapes. 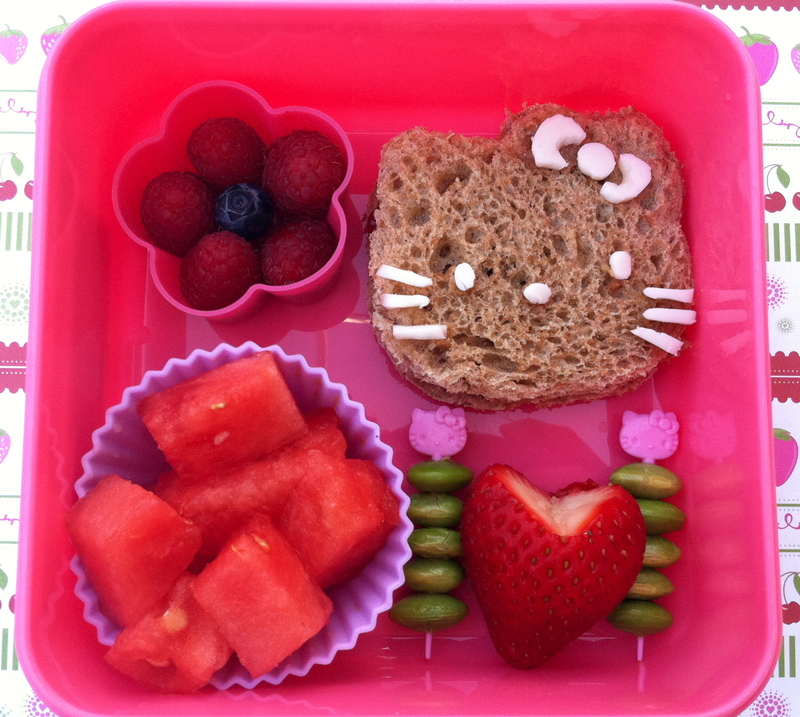 She had Hello Kitty sitting down with the same Hello Kitty stamped cantaloupe, green grapes and Craisins packed in her Hello Kitty bento box too. The sandwich cutters came from the local Sanrio store and are cookie cutters. The small vegetable & fruit cutters with stamps I found on eBay in Japan along with the Hello Kitty bento picks. My husband has another healthy salad for lunch today. He has all baby greens (spinach, kale, arugula and radicchio) topped with an orange heirloom tomato sliced and star shaped carrot slices. 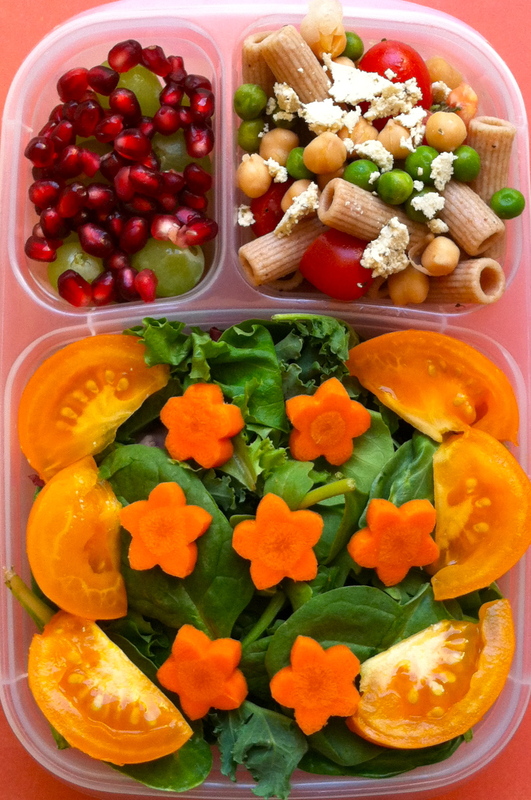 At the top left are grapes and pomegranate seeds sprinkled on top. At the top right was last night’s dinner here. It’s Einkorn rigatoni, lemon juice, lemon zest, garlic, and white wine vinegar mixed with sweet peas, grape and plum tomatoes sliced, garbanzo beans (chickpeas) and topped with a small bit of soy feta cheese. 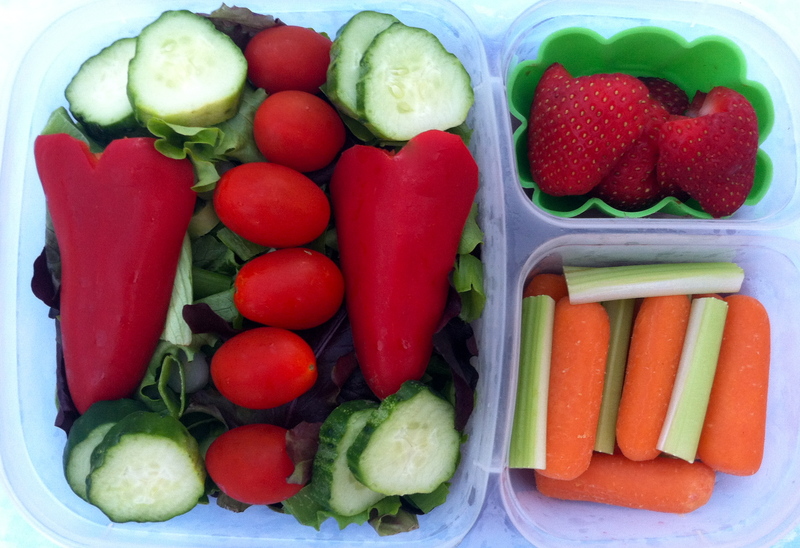 All if it is packed in his Easy Lunch Box. The girls love Hello Kitty so I decided to do one more for fun. 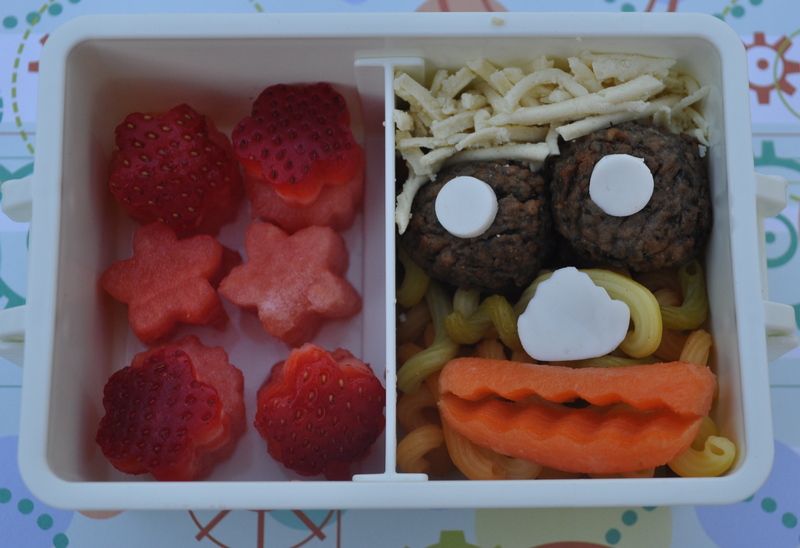 Please visit the Bento Blog Network. My bentos are #s 20 and #23. Stop over there and check out all the awesome lunches people made, and you can vote for your favorites! It’s still Q week at school so I decided to make her Queen Hello Kitty. She’s made on whole wheat bread quished a bit with a rolling pin. I used a LunchPunch for the crown but the cat and her bow are both cut by hand. The jewels on the crown are edible Easter confetti made of potato starch. I stuck everything on today with almond butter. She has prune ovals for eyes, a dried cranberry for her nose and fruit leather strips for her whiskers. Her wand is a pretzel stick with a gummy heart. I try to make it a rule to not put candy or sweets in her bento any more, but I made an exception with this one leftover from her Valentine candy. On the top right are raspberries and strawberries with a Q pick in them and below that is a Hello Kitty Easter container with walnuts, almonds and raisins in it. Little A has Q week too at school. She gets a simple queen with an oval face, candy eyes, dried apricot crown and a dried cranberry mouth. 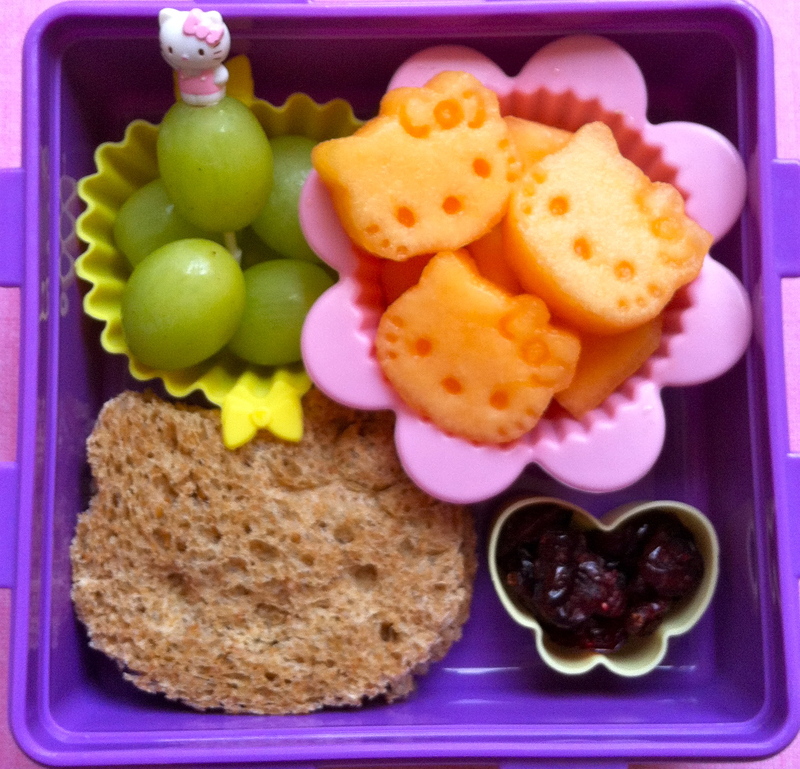 In her Hello Kitty container are raisins, dried apricot and mango pieces. 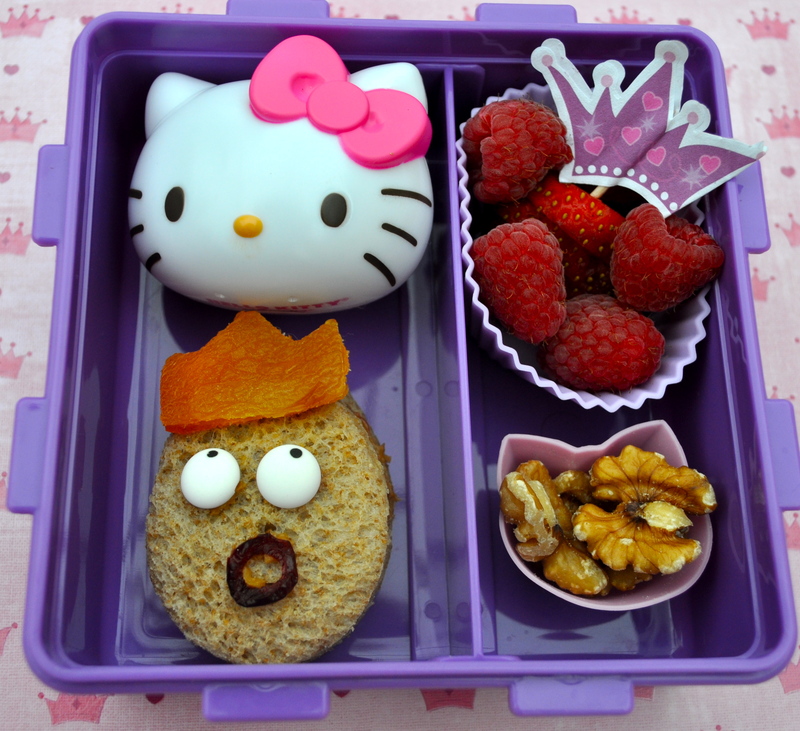 At the top right is a sliced strawberry and raspberries with a crown pick and walnuts in the kitty container below. 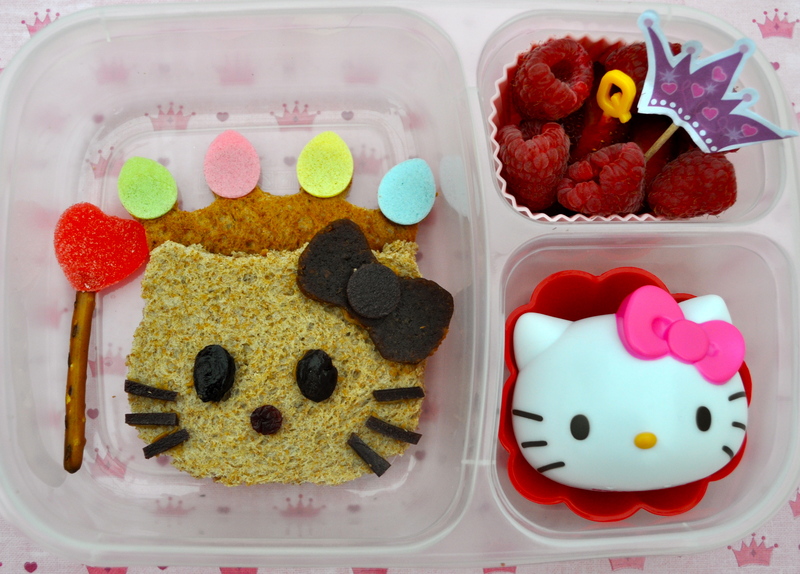 So the Bento Blog Network is having Hello Kitty week. 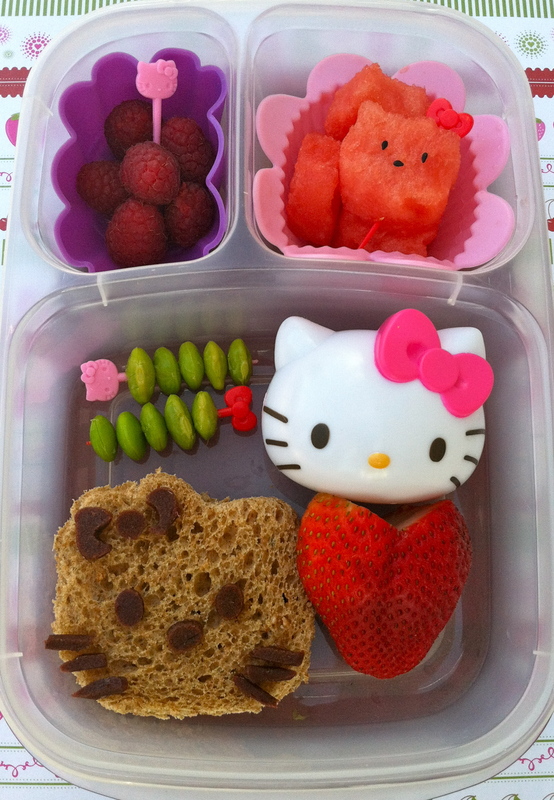 I put in a lunch from last year, but I am overdue for a Hello Kitty lunch considering how crazy Miss G is over her. This one would have been fabulous had I put it together last night. Since I did it in a rush this morning I had to patch a few botched cheese oopsies. The actual sandwich is cut from a circle biscuit cutter on Rudi’s 14 Grain Bread with almond butter & jam. 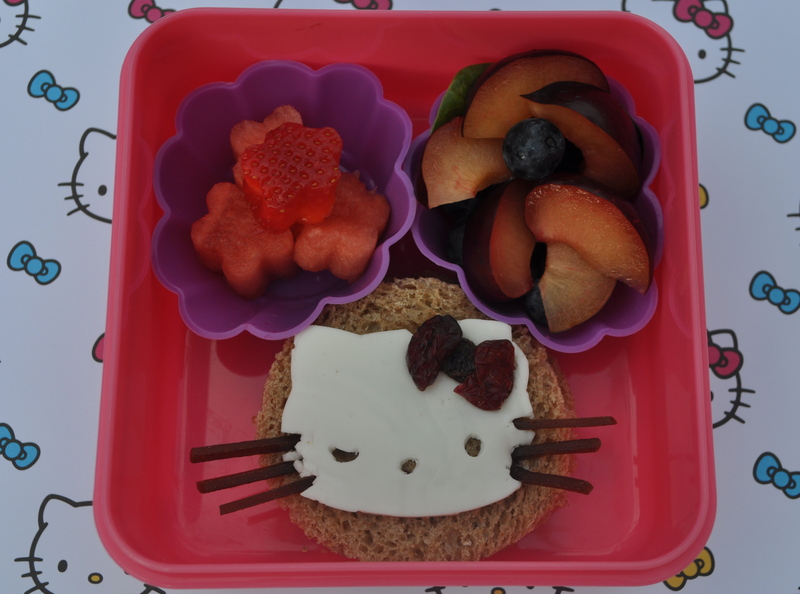 The cheese for Hello Kitty’s face is Veggy brand “Mozzarella” cheese made from soy. It tastes just like cheese to me but it’s a lot more fragile to cut than real cheese (hence the tearing). I used a template and a tiny paring knife to cut her face out. The bow underneath was a bit mangled so I made a new one of a raisin in the middle and 2 Craisins for the outside. The whiskers are fruit leather strips poked into her face to stay. The top left cup has watermelon and strawberry flowers and the top right cup has spinach leaves for garnish, blueberries underneath and a plum slice flower. Little Miss A has been a super picky eater as of late. The terrible 2s have really set in with her. She’s come out of her little shell chucking food and climbing furniture like a pro these days. Appropriately she gets a little monster today for lunch. On the right side are quinoa veggie curl pasta with eggplant meatballs. His eyes & nose are made from the same Veggy “cheese” slice, his mouth is a crinkle cut mini carrot and above his eyes are Daiya vegan “cheese” shreds. 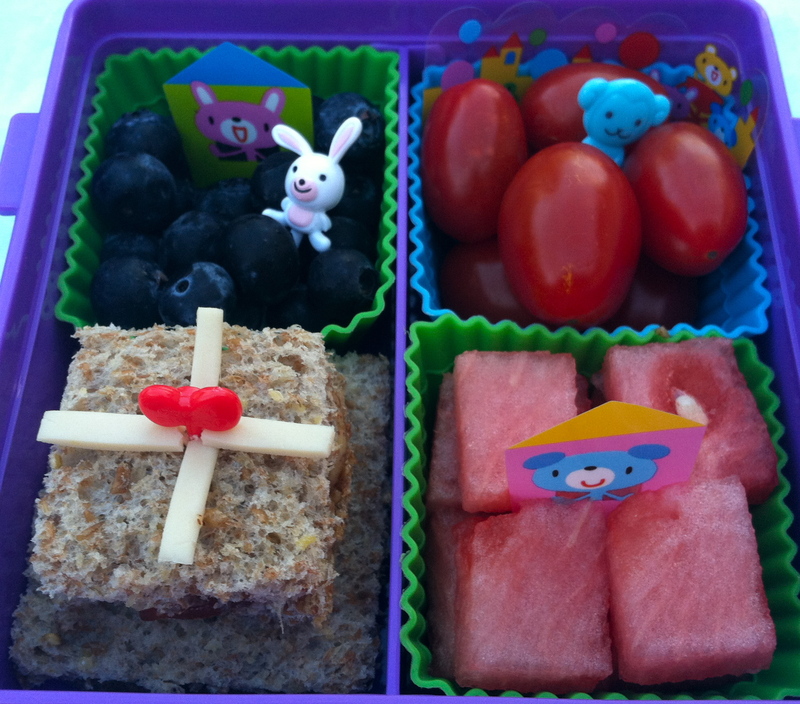 On the left are watermelon and strawberry flowers packed in her polar bear bento box by Gel-Cool. I have been looking back over some lunches I did a while back. Some of you may have seen them already on Facebook, but I thought a tutorial might help if you’re looking to replicate them at home. I made this one with flatbread, but regular bread or sandwich thins work nicely too. I hand cut the sandwich shape. Kitchen glasses work nicely to cut circles or just a plain circle cookie cutter work well too. I used raisins for the eyes and a craisin for the nose. Kitties whiskers are 2 strawberry Pocky sticks broken and stuck into the sandwich. You can find them in the asian section of your grocery store or at almost any asian grocer. They’re about $1 per box, and use them quickly because they get stale fast. 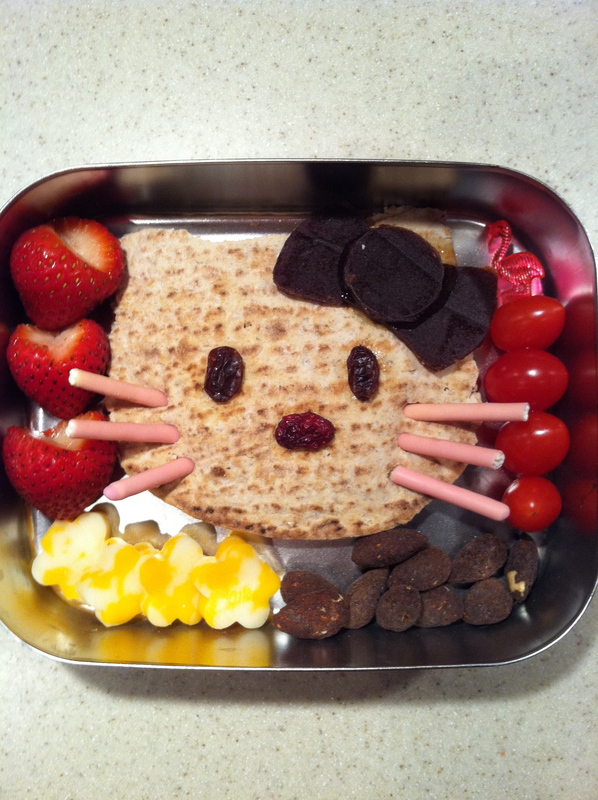 I also hand cut Hello Kitty’s bow out of fruit leather. I cut a V out of the top of the strawberries to take the stem off, and it usually comes out heart shaped. On the flamingo pick are 4 organic grape tomatoes. I included cocoa almonds for a treat and cheese flowers. I really like LunchBots to pack the lunches in. I buy them through http://www.reuseit.com where I find tons of great stuff to replace the disposable products most people use. They are stainless steel, wash well and never pick up odors from day to day like plastics will.